5 Favorites Stalls Worth Queuing For At Chinatown's Hong Lim Food Centre! - Let's Nom-nom! 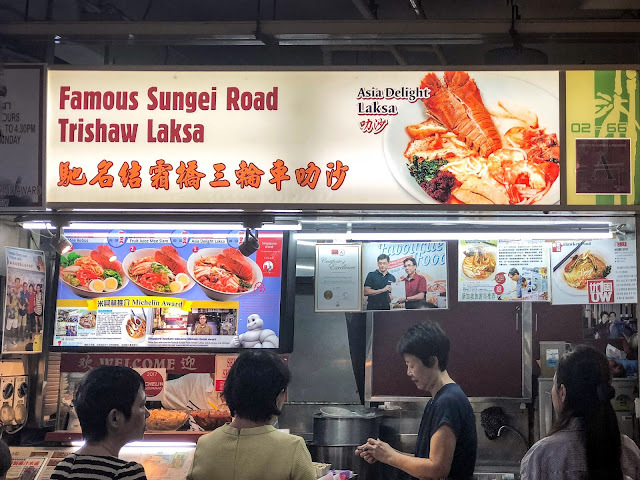 Home / Bib Gourmand / Chinatown / Food Guide / Food Singapore / Hawker Centre / Hawker Food / Hawker Singapore / Hong Lim / Hong Lim Food Centre / lFeature / Local Food / Michelin Guide / Must Eat / Must Try / Must Visit / Singapore / 5 Favorites Stalls Worth Queuing For At Chinatown's Hong Lim Food Centre! My overseas friends often ask me about the best local food they must try whenever they visit Singapore. For me personally, I always think hawker centre has its own local charm, hence I usually suggest them to visit at least one if they have never before. 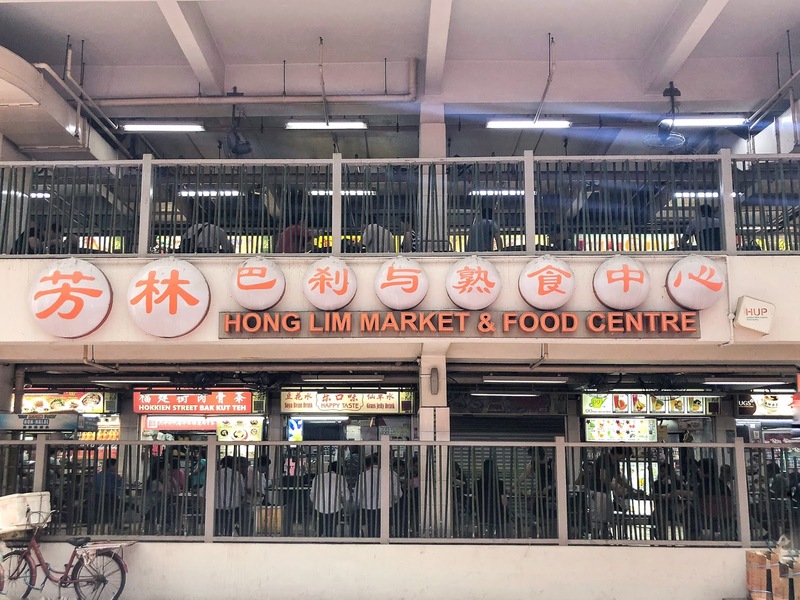 Talking about my favorites, I can say my no 1 is Hong Lim Market and Food Centre at Chinatown. I always mention it to everyone who's asked me for recommendation. This 2-story centre hosts more than 100 food stalls and some even take spots in the Michelin Singapore Bib Gourmand list! Ps: Although this place is well ventilated, I suggest you to come around 11am before it gets hotter and more crowded by office workers. Be prepared to queue unless you come super early in the morning as this stall starts operating as early as 6am. I usually come here before 11am and still have to wait for about 40 mins till I get my precious Char Kway Teow (CKT). 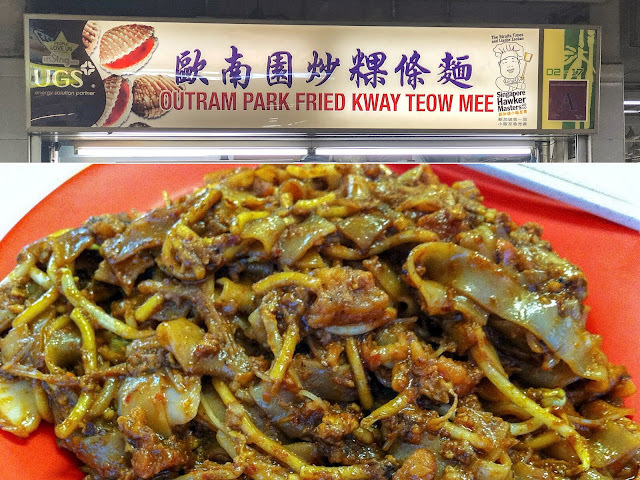 Heard that they simply use more eggs to get the kway teow texture that's more moist, slightly sweet and definitely full of fragrance. Each plate costs $3 and you can also top it up if you want bigger portion, extra eggs or even extra cockles. 6am - 3.30pm Monday - Saturday, Closed on Sunday and Public Holidays. 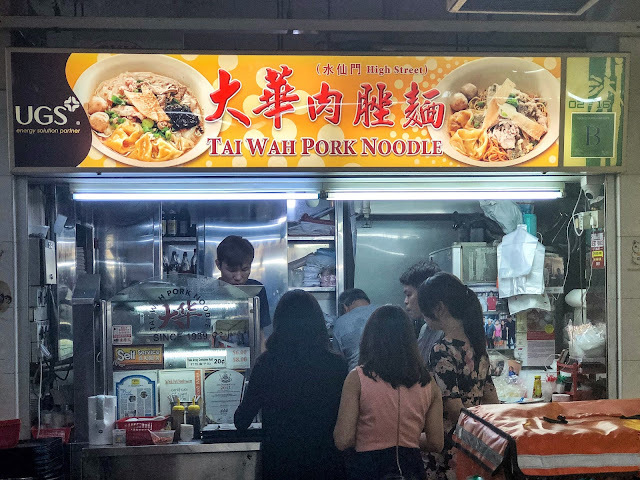 Not to be confused with Hill Street Tai Hwa (The 1-Michelin Starred Bak Chor Mee aka BCM), Tai Wah is managed by the other brother and in my opinion this stall has similar taste or shall I say the closest alternative with more manageable queuing time. Their Dry Bak Chor Mee is still my favorite especially with a distinct tart taste of vinegar from their sauce base. You can also choose which type of noodle you'd like and don't forget to also order their meatball soup! When we went there, people had started queuing even before it opened. My tip? 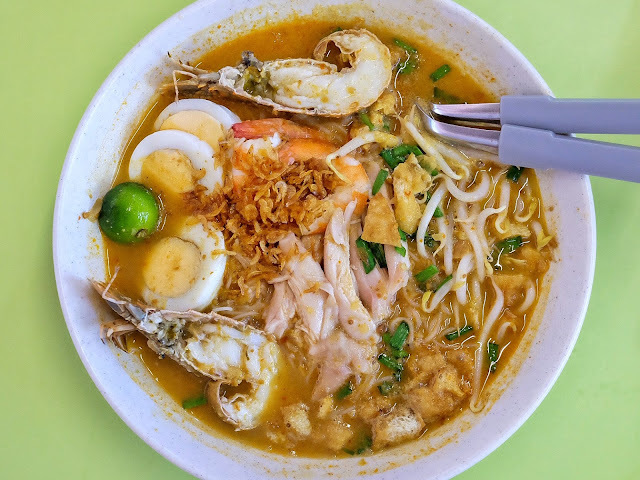 Better come early and be the first in line before they sell everything out, especially after this stall has been listed in Singapore Michelin Bib Gourmand in 2016 and 2017! Started since 1965, this stall has been running for 3 generations! 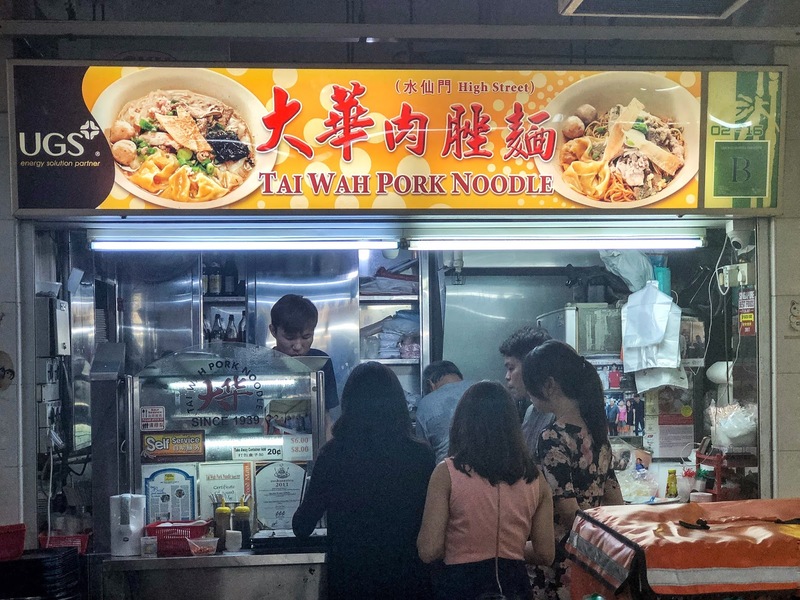 Although they have other varieties, Ji Ji's Char Siew Wanton Noodle is still the one I choose every time I join the long queue at this stall. I simply love their thin, springy, and chewy noodle texture - heard that it's specially manufactured by their supplier and thus differentiate themselves from others elsewhere. 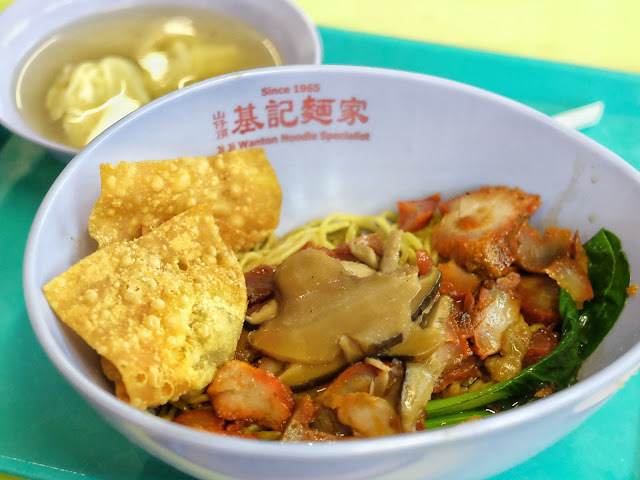 Together with their wantons, dark fragrant sauces, tender char siew, and flavorful braised mushroom, what you'll have is a simple but definitely tasty dish! 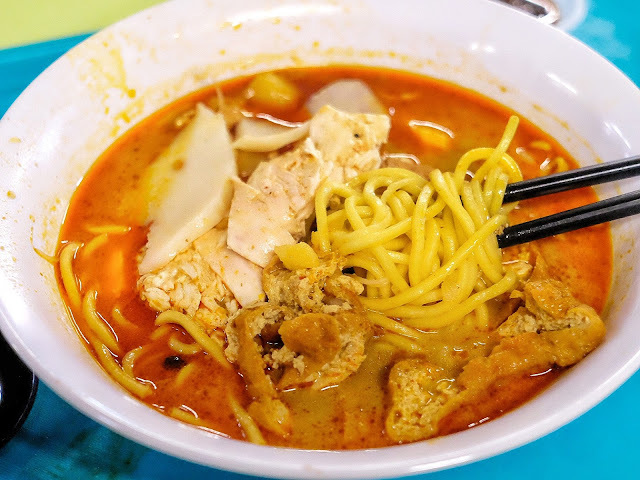 Another stall listed in Michelin Bib Gourmand List is Ah Heng Curry Mee. 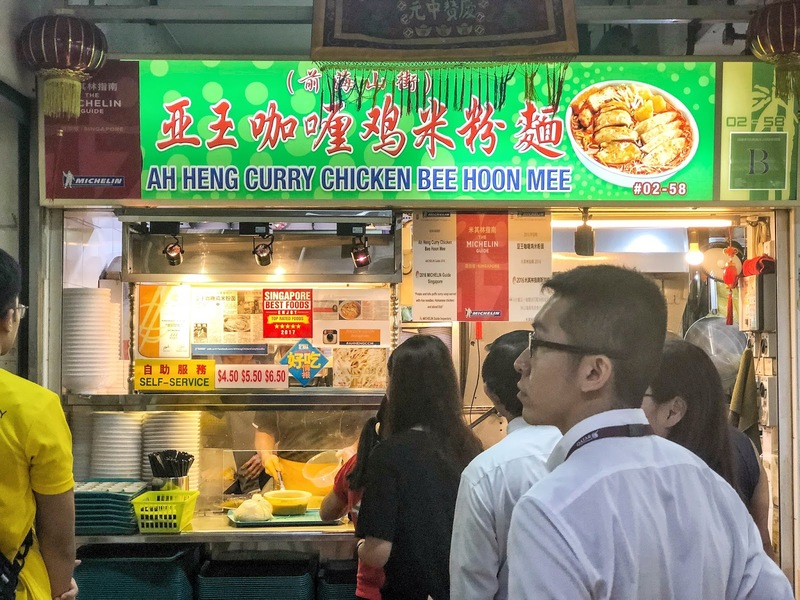 Here they sell Hainanese Poached Chicken with Curry Mee/Bee Hoon. 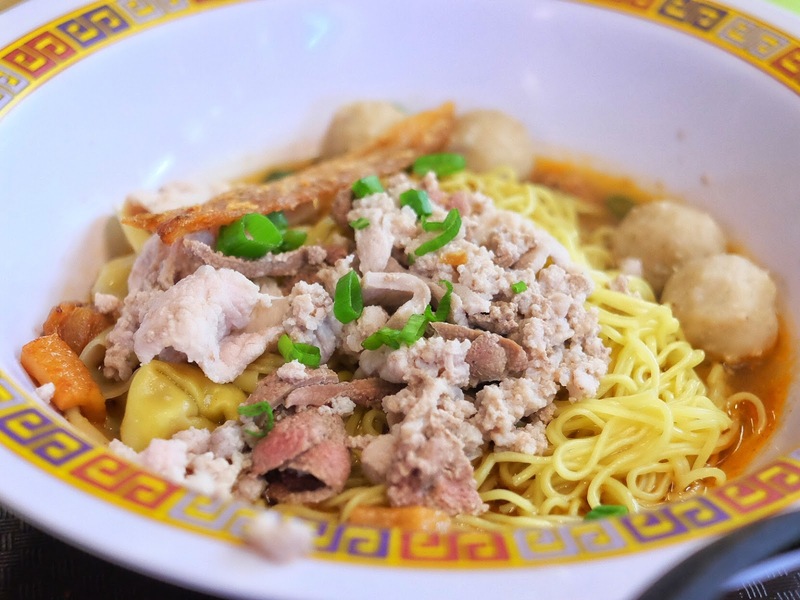 Available in 3 sizes,you can choose to have it with bee hoon (rice vermicelli) and/or with mee (yellow noodles). Each bowl has tender pieces of chicken, potato, beancurd puffs, and fishcake slices.